Pistorius faces tough questions Jump to media player South African athlete Oscar Pistorius says he "made a terrible mistake" when he shot his girlfriend Reeva Steenkamp in his home. Oscar Pistorius trial - Day 17 Jump to media player On day 17 of his trial, South African athlete Oscar Pistorius described the moment he fired the shots which killed his girlfriend Reeva Steenkamp in his home. Oscar Pistorius trial - Day 16 Jump to media player An emotional Oscar Pistorius apologised to the family of girlfriend Reeva Steenkamp, on the first day of his evidence at his murder trial. Pistorius: 'I'm scared to sleep' Jump to media player An emotional Oscar Pistorius has appeared in the witness box for the first time, as his murder trial resumed in Pretoria, South Africa. Oscar Pistorius: The trial so far Jump to media player The BBC's Karin Giannone looks at the trial so far as lawyers for the South African Paralympic champion Oscar Pistorius prepare to open the case for the defence in Pretoria on Friday. Jury sees video of Pistorius shop kiss Jump to media player CCTV of South African athlete Oscar Pistorius kissing girlfriend Reeva Steenkamp has been shown at his murder trial. Pistorius 'had loving relationship' Jump to media player The lawyer of Oscar Pistorius, the South African athlete accused of murdering his girlfriend, has denied claims the couple were unhappy. The South African state prosecutor has begun his cross-examination of the athlete Oscar Pistorius. 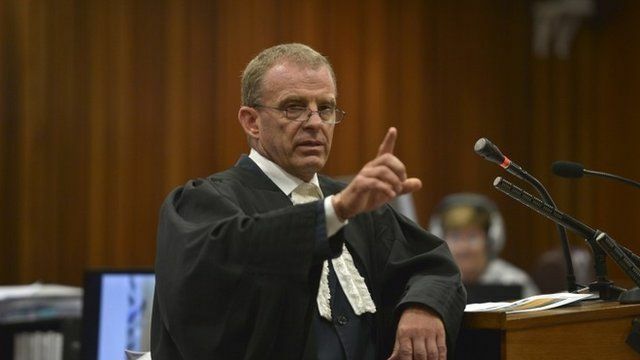 Responding to questions from Gerrie Nel, Mr Pistorius has said he "made a mistake" when he shot his girlfriend Reeva Steenkamp in his home. The athlete denies deliberately shooting dead Ms Steenkamp on Valentine's Day last year, arguing he mistook her for an intruder.